When you're on the lookout for lemurs  the unusually cute and endangered group of primates found only on the African island of Madagascar  it helps to have good eyes (lemurs are small), sharp ears (they rustle the trees) and a keen nose (they have an unmistakable smell). I'm walking through the Réserve Spéciale d'Analamazaotra, a few hours' drive west of Madagascar's capital of Antananarivo. The reserve is one of the few remaining patches of untouched forest on Madagascar, where more than 90% of the native tree cover has already been lost; chameleons, rare frogs and lemurs make their home here. It's late afternoon, and patches of early spring sunlight (this is the Southern Hemisphere) peek through the Ravenea louvelii, the native palm. Lemurs are sleeping this time of day, though, and a sleeping lemur is hard to spot. But then our guide, Marie Razafindrasolo, stops us  perched on a branch some 20 feet up is the black and white indri, the largest of the living lemurs and the symbol of Madagascar. After a few minutes, the indri gives a high-pitched, sustained cry  a spacing call, a warning to any other indri in the area, and a sound that stays with you. It's hard to say how long the indri itself will stay with us. Madagascar's native plants and animals evolved in isolation for some 80 million years; as a result, the 587,000-sq-km country, which sits just off the coast of southeastern Africa, has perhaps the highest level of biodiversity per capita in the world. It's what conservationists call a "hotspot"  one of about 25 places on Earth that have suffered massive habitat loss and account for less than 2% of the planet's land surface, but are home to about half the world's plant species and a third of vertebrate animals. Because the vast majority of Madagascar's 2,300 species are found nowhere else on Earth, if a species is lost on Madagascar, it is lost forever. Yet rampant deforestation, a swelling human population and the early effects of climate change have already pushed countless species out of existence. 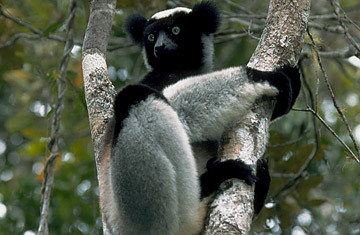 Of the surviving 71 lemur species and subspecies on Madagascar, 63% are endangered. "Madagascar is the hottest of hotspots," says Russell Mittermeier, the president of Conservation International (CI) and a renowned primatologist. If we care about saving our wild cousins from extinction, Madagascar is the place to start. That's why Mittermeier and I are here, to see Madagascar's wildlife while we can, and to see what's being done to save it. After a day in Antananarivo  a sprawling, diesel-soaked city that earns the adjective "teeming"  we leave by car for Andasibe, a former logging village that is now home to a burgeoning ecotourism trade. On the winding road we see the result of centuries of tavy, traditional slash-and-burn agriculture. The verdant forests that once covered much of Madagascar have been burnt or torn down, replaced by muddy rice paddies and secondary shrubs. This loss of habitat is the primary driver of extinction on Madagascar. The trees support a web of life, from the hefty indri to dazzlingly tiny frogs that fit on your pinky, but deforestation in Madagascar is so severe that the island's soil, unmoored by the loss of the trees, simply slides into the sea. The crimson trail of erosion has been visible from space. It makes sense, then, that sustaining the forests would be the first step in saving the wildlife. For decades in Madagascar, as in much of the world, that has meant the creation of protected parklands like the Réserve Spéciale d'Analamazaotra, where one goes hunting (with cameras) for lemurs. But now scientists recognize that deforestation in tropical countries like Madagascar could be responsible for up to a quarter of global greenhouse gas emissions, giving another new incentive to save and expand forests. Near Andasibe, CI and its partners are working on a project that will hire local villagers to plant new trees on land that had been cleared. The benefit is two-fold: The new forests will earn carbon credits under the Kyoto Protocol, since the trees will sequester carbon dioxide that would otherwise warm the atmosphere, and eventually the forests will help rebuild the disappearing habitat for species like the indri. What's more, the project employs job-hungry villagers and gives them a financial stake in the new forests, which is key if conservation is going to work. To save the animals, you need to save the trees, and to save the trees, you need to save the people. "We're bringing back the shelter of the forests, and we don't have to cut trees for charcoal," says Herve Tahirimalala, 28, who is paid about $100 a month to work the plantation  a decent wage in one of the poorest nations on Earth. Poverty and habitat loss go hand in hand in Madagascar and in much of the developing world, and only win-win solutions will work for conservation. A walk through Analamazaotra reminds you of how much there is to be gained when projects like this work  or lost, if they fail. After the sun sets, Mittermeier and Razafindrasolo lead a nocturnal tour along the outskirts of the reserve. The forest throbs with invisible life. What we can't see, we can hear: tree frogs mating, insects whirring, a rustling through the branches. Our flashlights pierce the canopy, but just barely, before a thicket of leaves absorbs the beam. After hundreds of years of human exploration on this island, there are still countless species that have yet to be described  and that may be lost to extinction before we ever discover them. Our knowledge of this planet's incalculable richness is barely more complete than a flashlight's illumination of a tropical rainforest  brief and finite  but our capacity for destruction is limitless. Finally, our guide's passing beam catches the shining eyes of an indri in the night, reflecting back at us. It holds the light for a moment, and then, with a leap, it's gone. Click here for pictures of Madagascar's flora and fauna. Click here for pictures of primates on the danger list.